Freada Kapor Klein’s work is at the intersection of tech and racial/social justice. She is a Partner at the Kapor Center for Social Impact (www.kaporcenter.org). The Center relentlessly pursues creative strategies to leverage information technology for positive, progressive change; and works primarily with under-represented communities, focusing on gap-closing endeavors. As a Partner at Kapor Capital (www.kaporcapital.com), Freada invests in tech start-ups that solve real problems, aspiring to simultaneously generate economic value and positive social impact. Kapor Capital’s investment sectors include–but are not limited to–education, health, and consumer finance. She is particularly interested in investing in women entrepreneurs and entrepreneurs of color. 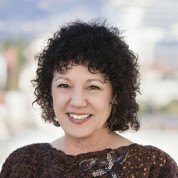 Freada is the founder and Board Chair of the Level Playing Field Institute (www.lpfi.org), which promotes innovative approaches to fairness in higher education and workplaces. The Institute’s Summer Math and Science Honors Academy (SMASH), a three-summer high school program serving under-represented students of color, is in the process of scaling nationally. Half of SMASH’s participants have always been girls. The Academy works to ensure racial equity within the fields of science, technology, engineering, and mathematics. The Institute’s workplace programs have conducted landmark research, including the 2011 study The Tilted Playing Field: Hidden Bias in IT Workplaces. Freada’s book Giving Notice: Why the Best and the Brightest Leave the Workplace and How You Can Help Them Stay (Jossey-Bass 2007) combines quantitative research on who leaves corporate America and why, with stories of day-to-day experiences detailing the human and financial cost. Freada co-founded the first organization in the U.S. to address sexual harassment in 1976. She holds a Ph.D. in Social Policy and Research, and has conducted many large survey projects on perceptions and experiences of bias, harassment, and disrespectful treatment in workplaces. Her first job in tech was as the first head of Employee Relations, Organizational Development, and Management Training at Lotus Development Corporation. Her job description was to make Lotus the most progressive employer in the U.S. Lotus 1-2-3 is widely recognized as the “killer app” that made the personal computer ubiquitous in business. Freada is also an Advisory Trustee of the U.C. Berkeley Foundation, an Advisory Board member of The Workers Lab, and an Advisor to CrossCulture VC.